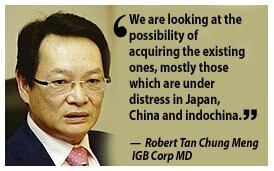 KUALA LUMPUR: IGB Corp Bhd plans to focus more on its hotel and property investment divisions to drive its growth and expansion as both businesses offer better gains, says group managing director Robert Tan Chung Meng. “Our offices under the property investment division provide strong recurring income to the group and the hotel’s expansion and acquisitions are much easier as less hassle is involved,” he told reporters yesterday after the company’s AGM. Tan said the group was aggressively looking to build hotels and acquire existing hotels locally and in countries such as China, Japan and Indochina. “We are reviewing proposals for that matter but, for us, location is the most important thing to be considered before any decision is made,” he said, adding that the group’s latest hotel, located in Manila called St Giles Hotel, would be fully operational by the third quarter this year. Tan said new property launches would depend on the market conditions. He also said The Mid Valley City phase 3 that was put on hold in 2009 had been re-planned as a commercial development. Meanwhile, IGB had posted a slightly higher net profit of RM35.3mil for its first quarter ended March 31, compared with RM33.9mil in the previous corresponding period due to improved performance by the other divisions. It told Bursa Malaysia yesterday that revenue for the period was lower at RM156.1mil versus RM165.6mil previously due to lower contributions from the property development division while earnings per share for the period were 2.42 sen against 2.31 sen before. With almost half of its profits from hotel division, property developer IGB Corp Bhd plans to expand the business overseas, namely to Japan, China and Indochina. Its managing director Robert Tan Chung Meng said the group will either buy existing hotels or develop new ones abroad. "We are looking at the possibility of acquiring the existing ones, mostly those which are under distress. In such cases, it is easy for us to spread our business activities in this sector if we acquire those existing hotels, which are mostly located strategically within city centres," he told reporters after the group's annual general meeting in Kuala Lumpur yesterday. The group now manages a hotel in the UK and owns several hotels locally, including the Cititel hotel chain, MiCasa All Suites, The Gardens Hotel, The Boulevard Hotel and the Pangkor Island Beach Resort. IGB is set to launch its three-star hotel in Makati, the Philippines in the next three weeks. 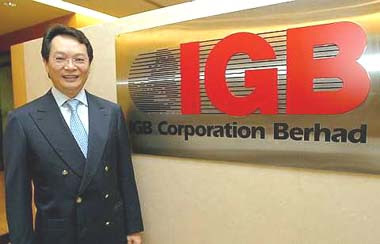 Financially, IGB expects to maintain profitability for this financial year ending December 31 2010. Last year, it registered a net profit of almost RM159 million, up against RM155 million previously. This was achieved on the back of RM642 million in revenue for 2009, compared with RM688 million previously. Yesterday, IGB announced that the group made a net profit of RM42 million for its first quarter ended March 31. This was highwer from RM39 million posted over the corresponding period last year. Moving forward, Tan said IGB will focus on property investment, rather than property development. "I don't expect to see any new project launches this year, despite several proposals that have been lined up for approvals from the authorities. We want to optimise our existing assets," he said. Tan said contribution from property investment and management exceeded RM90 million last year compared with the previous year's revenue of about RM60 million. Despite a subdued market and strong competition from new offices, the division recorded an average occupancy rate of above 90 per cent. Tan also provided an update of the Mid Valley City Phase 3 project, which was put on hold in 2009. With a gross development value of RM500 million, he said the Mid Valley City Phase 3 has been re-planned as a commercial development and will proceed upon approval. PROPERTY developer Mah Sing Group Bhd posted a 24 per cent rise in its first quarter net profit due to better performance in its property and plastic divisions. Its net profit was at RM28 million, an improvement compared with first-quarter net profit of RM22.6 million during the same period last year. "The group's residential and commercial projects helped contribute to the good results," Mah Sing said in a statement yesterday. Revenue for the quarter was at RM238.3 million, up from RM150.3 million a year ago. Main property project contributors were Southgate, Hijauan Residence, Kemuning Residence and Aman Perdana in Klang Valley, Residence@Southbay in Penang as well as Sierra Perdana and Sri Pulai Perdana 2 in Johor Baru. The group is confident of achieving its RM1 billion sales target for 2010 as it has met 60 per cent of the target or RM601 million sales in the first quarter of 2010. "Prospects for the residential, commercial and industrial segments are bright, given a better employment market, strong liquidity, pent-up demand and still-conducive interest rate levels," it said. As at March 31 2010, the property group has unbilled sales of approximately RM1.1 billion, giving it significant earnings visibility. To date, it has bought three pieces of prime land with combined gross development value of RM712 million. Currently, the group has a total of 26 projects in the Klang Valley, Penang and Johor Baru, of which five have been completed, 11 ongoing and ten new projects in the pipeline. RHB Capital Bhd is taking control of Positive Properties Sdn Bhd, which owns a 0.51ha freehold site along Jalan Tun Razak, Kuala Lumpur, for future development. The banking group plans to house all of its operations at the same location for better efficiency. RHB Capital has signed a deal to buy half of Positive Properties for RM35 million from Bedford Land Sdn Bhd, making the former its wholly-owned unit.